People ask: “What is your favourite plant?” “Favourite flower?” “Favourite fern?” “Favourite tree?” No one ever asks about your favourite branch, but here’s mine. The overall shape and habit of a plant is determined by only a few factors. Genetic factors are foundational; barring a mutation of some kind, any member of a species will look similar to other members. How the genetic factors are manifested in the physical individual, though, depends in large part upon the environment. Phenotypic plasticity is the ability of an individual organism to respond to environmental factors. Being sessile, plants generally have elevated abilities to physically differ in shape and habit from one another in comparison to mobile organisms, like animals. For example, take two clonal magnolia plants (genetically identical) and plant one in shade and one in moderate sun. Assuming both survive (and all other factors being equal), it is likely the shade-grown plant will have longer (but weaker) branches in comparison as the branches undergo etiolation in an attempt to gather more light for photosynthesis and, therefore, growth. Grow the same two plants in similar conditions and it is likely they will grow at similar rates and achieve the kind of uniformity one often sees in properly-spaced street trees. Returning to today’s photograph: it is likely that there is a genetically-determined (and physically manifested via hormone production) minimum branch length between buds/nodes in order to ensure that the flowers are not so close together as to interfere with each other. The photograph is a two-dimensional representation of the three-dimensional scaffolding, so you’ll have to use your imagination and “see” the spacing in what otherwise look to be overlapping flowers. 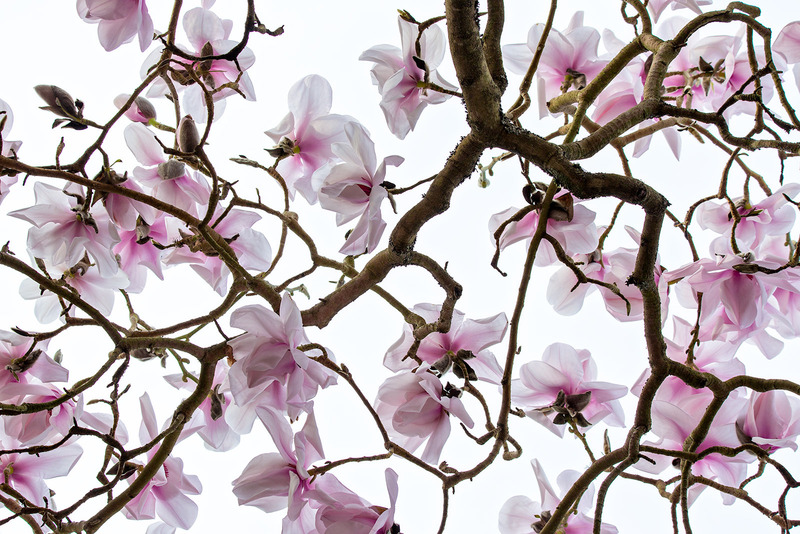 This Sargent magnolia grows near the entrance to “The Tunnel” in the David C. Lam Asian Garden, here at UBC. When I last checked on this plant on Thursday, the terminal flower buds were not showing any colour. I suspect it’ll be at least a week before it looks like this, though many of the garden’s magnolias seemed to accelerate into full bloom over the past (somewhat) sunny weekend. It was thought that only around 40-50 trees of Magnolia sargentiana remained in Yunnan but Global Trees Campaign field surveys in April 2006 recorded 12 sites with a total population estimated at about 20,000. A Sichuan University/University of British Columbia Botanic[al] Garden team recorded extensive and protected populations in two of four main reserves in the Dafengding region of southern Sichuan covering at least 60,000 ha of mixed evergreen/deciduous forest, during fieldwork in September 2006. OMG! Daniel, that is one Bogglingly beautiful foto. Thanks for the message of spring and the information on the how/why of the branching. WOW!!! SO glad you are back online with this insighful info and fotos. THANKS! Another wonderful photograph and entry. Takes my breath away, so beautiful ! Perfect time to take pictures! My favorite branch is the sinuate structure of those of Robinia pseudo-acacia. These give the tree an unmistakable physiognomy, especially in winter when silhouetted against an evening sky. Those have certainly caught my eye as well! Is it named after Charles Sprague Sargent of the Arnold Arboretum ? Did he introduce this Magnolia into cultivation ? And was he also the explorer who found & brought it from China ? A very lovely tree – and a beautiful photo ! Yes, no, no! Yes, named after Charles Sargent. It was introduced to the West in 1908 by Ernest Henry Wilson, after he first encountered it while exploring China. That’s so lovely, I hope you don’t mind that I just set it as the wallpaper on my computer. It is the perfect image of spring. An update: I checked on this plant today. The flower buds are beginning to open, though no flowers are fully-open yet. My original estimate looks good–another week. However, with the rainy forecast, I suspect the flowers will get tattered quickly.